Parent story: Kaichou wa Maid-sama! "∞ Loop (∞ループ)" by heidi. In my opinion, I think this episode was okay. The thing was, people have been saying this episode would be about Usui and Misaki having a date for her birthday, or something along those lines. Let me say that it had completely nothing to do with that. 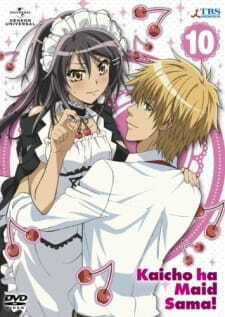 Do not get me wrong, I love Kaichou wa Maid-Sama; it is one of my favorite animes ever, but I really was expecting more. This "special" just seemed to be all over the place and I did not enjoy that. I really was disapointed with the special, but I still love the anime. Put simply - short and fun. I would have preferred Usui and Misaki going on a date but, alas, this is not the case. The whole episode takes place at Misaki's home and there's a little bit of fan service with both her mum and sister taking turns wearing her Maid costume. There's no real story and it's like a slice of life type episode, with Misaki getting more and more embarrassed with the unexpected visitors throughout the episode. Enjoyable but doesn't add anything to the series but worth watching. After coming off the main series, one may be craving more from this romantic comedy series. I personally loved it and, like many other fans, wanted more. So I instantly went looking for this 27th episode/OVA special that I had heard about. How does this hold up in regards to the rest of the show? Frankly, this is an "epilogue" of sorts....or is it? Given no real EXACT continuity, we assume this takes place after episode 26 (due to a few minor subtle points). However, in the end, it ultimately doesn't matter really. This special episode is half the length of a normal episode of Maid-Sama! and is simply just a way to give the audience more to grab at as the show ends. Not a bad thing, but is it vital to the overall experience? I'd argue....mostly, no. Besides a final ending scene in which we get more exposition (pretty good at that) on the little kitten Usui picked up about halfway through the main series, the rest of the episode adds little to Maid-Sama! as a whole. Frankly, it makes you crave a second season THAT much more....and leaves a small sense of....dare I say it....unsatisfaction. Plot ideas for the OVA special could have been better: Misa and Usui going on a date or Misa finally comes out about her job as a maid....and it turns out no one really cared/thought it was a big deal (as I thought they were going to do at some point in the show for lesson-sake). In a practical sense, buying the BluRay/DVD release of the anime that contains this special costs on average $20 more dollars than just buying the previous edition with only the full 26-episode show. So for 13 more minutes of Maid-Sama! joy that is "eh, good" at best....I'd say this special isn't worth the cost (if you are planning to buy this series to start). Ultimately, the art here is as good as the regular show without any deviation. The sound is one of the highlights of the show overall. Hearing that opening theme one last time was worth the watch in itself, as well as the in-show music. Overall, this episode is like a little mint at the end of a great dinner. You can go without it. Or let me put it this way: It's like putting sprinkles on something....and we all know sprinkles don't really add flavor. Oh brother… this was sort of a boring OVA. Sadly, it didn’t clean up any of the questions that I had after the TV version. It was definitely just an extra episode that had nothing really to add to the series. Kind of sad really as all it was seemed to be just random slice of life even more so then the TV show. The plot was barely there, the thought of the show just seemed to string by in a rather odd sort of way. It’s really hard to explain a review for a single episode. We did get to see Misaki’s Mother and younger sister more but their personality hadn’t changed at all since the TV show. Again we didn’t get a lot from them at all, just her sister winning stuff and her mother acting clueless at times. They also use a gag that was used twice in the TV show again which just seemed a little overkill on that. Once, alright… I can picture this happening. Twice… maybe it could happen again. It’s just a matter of timing. Three times… that part of the street is just cursed right? The artwork is just the same as the TV series, its good but nothing stands out. The artwork is colorful but sometimes lacks in detail and every once in a while we get large blocks of color behind a character instead of showing the real background. There is still some flowers and strange lines that pop up out of no where to show different emotions but it just feels like the same stuff I have seen before. The voices are the same and I do have to say that some of the characters dubbings grew on me from watching the TV show. Not saying they were good or anything, but just that they were the same voices as before with the same sort of dialog. I did end up seeing slightly more emotion from Usui which was a plus but still, his voice had that same sort of drone that was present in the TV version. Like I said, this really was just a bland episode for me although it did show another interesting side of a couple characters. Not really worth watching if you didn’t like the main story but it’s alright if you finished the story and want that one more episode.